When it comes to crossovers, there has definitely been a mixed bag of possibilities, and I can honestly say that they rarely pull them off to successful results. What usually prevents crossover events form being successful, are the amount of restraint of stepping on each other toes, as they don’t want to disrespect each other’s properties. Case and point, is the oft remembered crossover event on television back in the 1960s between Batman and Green Hornet, which had detractors on both sides of the event. Eventually, to appease both groups of fans, they had two different endings, that appeared on their respective shows. Within the realm of comics, such endeavors faced similar challenges, as I remember the elusive and highly cherished crossover event between The Teen Titans and the Uncanny X-Men. I remember as a kid, it being sold out everywhere, and whatever copies were out there, were already behind a glass window in most comic shops. I know there were initially plans for a sequel, but both houses of Marvel and DC, could not come to a mutual agreement. Only if they would have came to agreement, who knows how many more crossovers it would have yielded. Fast forward to 2015, DC and IDW have created a crossover event, worthy to be regarded as one of the best in the collective histories of both publishing houses and as far as space operas go, they have definitely lifted the bar. Within this story, the USS Enterprise is en rout to Nodell-16, where they find a dead body of one of the Guardians, Ganthet. Shortly thereafter, three of the crewmembers are chosen by rings, as well as one of Star Trek’s more insidious villains, Chang. By story’s end, many iconic villains and heroes form both franchises reenter their respective universes, face off in epic battles and once again, what was wrong, is righted. Overall, an interesting story from beginning to end, and I must say, with all of the cameos throughout the story, it feels like what you want a crossover to feel like. The story by Mike Johnson shows his reverence and love for both franchises while remembering to keep it fun. 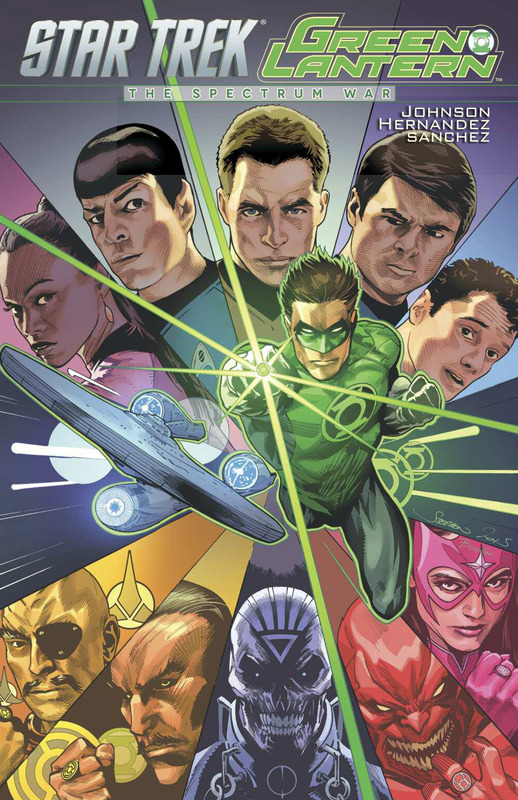 The art by Angel Hernandez definitely seems to cater to the Star Trek franchise, but it gives the Green Lanterns, a nice look as well. Altogether, an excellent crossover, which I hope there will be more of, as one can definitely see the promise.